Lately two postings on my feed reader popped up regarding testability. While reading through Michael Boltons Testability entry, I noticed that his list is a very good one regarding testability. The problem with testability from my perspective is the little attendance it seems to get. Over the last week I was inspecting some legacy code. Legacy is meant here in the sense that Michael Feather’s pointed it out in his book “Working effectively with Legacy Code”: Code without tests. Today I did a code review and was upset about the classes I had to inspect. After even five classes I was completely upset and gave up. In the design of the classes I saw large to huge methods, dealing with each other, moving around instances of classes, where no clear repsonsibility was assigned to, variables in places, where one wouldn’t look for them, etc. While I am currently reading through Clean Code from the ObjectMentors, this makes me really upset. Not only after even ten years of test-driven development there is a lack of understanding about this practice, also there is a lack of understanding about testability. What worth is a class, that talks to three hard-coded classes during construction time? How can one get this beast under test? Dependency Injection techniques, Design Principles and all the like were completely absent on these classes. Clearly, this code is not testable – at least to 80% regarding the code coverage analysis I ran after I was able to add some basic unittests, where I could. 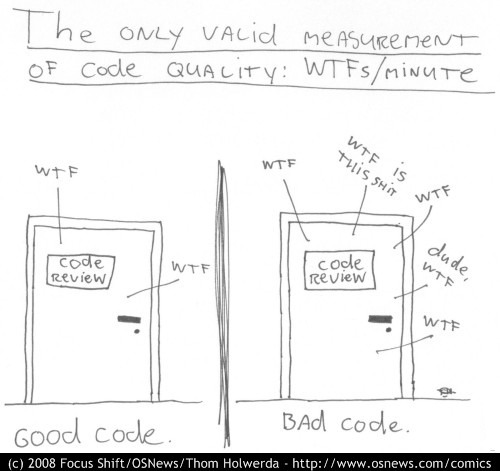 Code lacking testability often also lacks some other problems. This is where Michael Bolton, James Bach and Bret Pettichord will turn in heuristics and checklists, the refactoring world named these as Smells. I’d like to print this out and hang it all over the place at work.